This floor finish stripper brush has 1.75" long, 80 grit silicon carbide impregnated bristles and can also be used to directly scrub really heavily soiled areas. A very aggressive brush which is very popular in the automotive, and machine shop industries. This extremely heavy duty brush fits directly onto one of our 20 inch rotary floor buffer scrubbers, and must be run in a wet environment at all times. If using as a scrub brush, first test in an inconspicuous area to ensure that it does not remove the finish off of your floor. If it does, your scrubbing solution may be too strong, or you may want to try one of our less aggressive brushes listed below. On the other hand, if you're using this brush as a stripper, and it is not stripping off your old finish, you may need a more aggressive stripping solution. 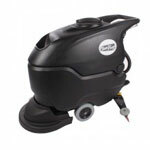 This universal floor buffer brush comes with a clutch plate attached. Specialty clutch plates can be ordered as well. Please give us a call at 855-242-9029 if you are unsure on whether or not this brush will fit your machine. Please feel free to check out our complete line of rotary floor brushes for additional options.